How public health education campaigns on simple tools such as hand washing can help to improve health and hygiene in India. According to an article in LiveMint, data has been released by the National Sample Survey Office (NSSO) from a survey conducted in 2012; which has once again underlined the abysmal state of sanitation in the country, particularly in rural India. According to this survey, only 32% of rural households have their own toilets and that less than half of Indian households have a toilet at home. There were more households with a mobile phone than with a toilet. In fact, the last Census data reveals that the percentage of households having access to television and telephones in rural India exceeds the percentage of households with access to toilet facilities. 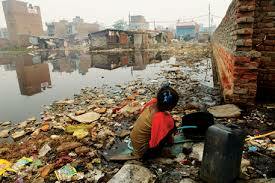 Of the estimated billion people in the world who defecate in the open, more than half reside in India. Poor sanitation impairs the health leading to high rates of malnutrition and productivity losses. India’s sanitation deficit leads to losses worth roughly 6% of its gross domestic product (GDP) according to World Bank estimates by raising the disease burden in the country. Children are affected more than adults as the rampant spread of diseases inhibits children’s ability to absorb nutrients thereby stunting their growth. As health economist Dean Spears argued “a large part of India’s malnutrition burden is owing to the unhygienic environment in which children grow up. Poor sanitation and high population density act as a double whammy on Indian children half of whom grow up stunted”. It is not a coincidence that states with the poorest levels of sanitation and highest levels of population density such as Bihar, Jharkhand and Madhya Pradesh also have the highest levels of child malnutrition in the country. This unhygienic environment is due to India’s historic neglect of public health services. The absence of an effective public health network in a densely populated country has resulted in an extraordinarily high disease burden. About 48 per cent of children in India are suffering from some degree of malnutrition. According to the UNICEF, water-borne diseases such as diarrhoea and respiratory infections are the number one cause for child deaths in India. Children weakened by frequent diarrhoea episodes are more vulnerable to malnutrition and opportunistic infections such as pneumonia. With 638 million people defecating in the open and 44 per cent mothers disposing their children’s faeces in the open, there is a very high risk of microbial contamination (bacteria, viruses, amoeba) of water which causes diarrhoea in children. Also, diarrhoea and worm infection are two major health conditions that affect school children impacting their learning abilities. There are many organisations and public- private collaborations working to improve access to toilets, improving drainage facilities and creating awareness through education campaigns on the importance of preventive tools such as hand washing. Hand washing with soap is among the most effective and inexpensive ways to prevent diarrhoeal diseases and pneumonia. Poor wash causes diarrhoea, which is the second biggest cause of death in children under five years. According to the Public Health Association, only 53 per cent of the population wash hands with soap after defecation, 38 per cent wash hands with soap before eating and only 30 per cent wash hands with soap before preparing food. Only 11 per cent of the Indian rural families dispose child stools safely. 80 per cent children’s stools are left in the open or thrown into the garbage. Schools provide an excellent opportunity for children and parents to learn about healthy hygiene practices. There is an urgent need for adequate, well-maintained water supply and hygiene facilities which include proper toilets and hand washing basins in schools all across India. Inadequate water supply and sanitation in schools are health hazards and affect school attendance, retention and educational performance. A good example of one such recent project was implemented by Save the Children in partnership with Harpic in New Delhi, India. More needs to be done about giving girls the knowledge and facilities necessary for good menstrual hygiene is key to their dignity, privacy, educational achievement and their health. Adolescent girls are empowered through improved menstrual hygiene management. There need to be awareness campaigns for mothers and caregivers. Hand washing with soap at critical times is important for protecting the health of the whole family. By being a role model, mothers and caregivers can also help instill in their children healthy hygiene practices, which will serve them for life. Until now, a number of innovative public health campaigns and programmes to improve health and hygiene have been implemented in India but more needs to be done. These include community-led public-private partnerships to improve access to toilets and awareness campaigns in schools and slums in both urban and rural sectors. There is an urgent need for more such campaigns all across India. for the increased population of India in rural, urban area we all Institutions government, non government, personal should continue approach applying at community , personal level . Poor sanitation affects health of children “SAVE GIRL CHILD” and teach them at a scholar money.